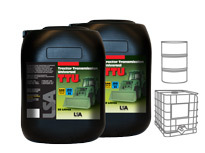 A universal tractor hydraulic/transmission oil (UTTO) ideally suited to agricultural and industrial equipment operating under severe load conditions. ZF Transmissions TE-ML-03E / TE-ML-05F. Recommended and designed for use in agricultural and industrial machinery requiring a common oil for gear, transmission, hydraulics, differential, final drives, wet clutches, wet brakes, PTO clutches and bearings.